The Custom Combination Sewage Air Valves are dual function venting large volumes of air through the large orifice and small pockets of air through the small orifice before shutting off spurt free. Thereafter, while the air valve is pressurized, pockets of air collecting will be vented through the small orifice automatically. Should vacuum develop in the force main, the upper spherical float will open the large orifice permitting large volumes of air to re-enter the force main to break the vacuum. The upper float is protected against opening vacuum impact with a Buna-N Bumper. 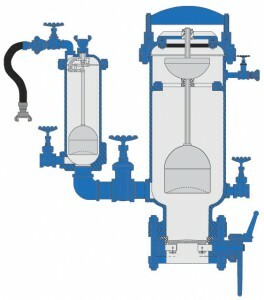 When the force main returns to normal pressure, the Combination Sewage Air Valve will close without spillage.